"Absolutely the nicest, smartest & best physician I've ever had." "Dr Pilapil is very patient, even with our screaming child during vaccines." "Dr. Pilapil is caring, professional and knowledgeable." "Dr Pilapil is so kind and patient with our kids. Even when they're all screaming from their shots, she doesn't get flustered"
"Dr. Pilapil is an excellent clinician." "Dr. Pilapil is so caring and educated. She takes time to explain things and never rushes." "Dr Pilapil is great with our kids. she is so patient and understanding, especially when they are scared and crying." "Loved her, a very young but confident physician"
"Just started with Dr. Pilapil - like her very much. She called back very quickly with follow-up info." "Excellent job Dr. Mariecel Pilapil. Please continue what you are doing. " "Dr. Pilapil is excellent in caring for my boys. She is caring and intelligent and I know they're always in good hands when they see her." "T_____ is autistic. Dr. Pilapil was so comfortable with him and knowledgeable. She was fabulous!!" "Dr. Pilapil is an excellent provider! SHe was warm, answered all our questions, addressed all the issues our son had. It was a very positive experience for all of us - we finally found the pediatrician for our family." "Very calm, shows empathy always." "Amazing care provider, no wonder her appts were booked up! Love Dr. Pilapil!" "the doctor was excellent, but because she spends a lot of time with each patient she seems to be constantly running behind schedule. That being said, I would much rather wait the extra time than feel rushed during my appointment." "Dr Pilapil is a dedicated sincere and caring Doctor"
"Dr. Pilapil is a wonderful doctor and shows kindness and compassion to my special needs daughter." "provider is so nice and shows concern to the patients"
"Excellent PCP; responds quickly to emails & documents of information when needed." "My Doctor make me feel very comfortable.I like her a lot." 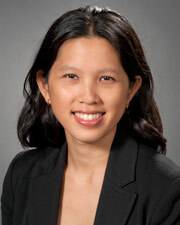 "Dr. Pilapil made some excellent suggestions; I have followed her advice & been pleased w/the results." "Dr. Pilapil was great. Very comfortable about switching to her as my daughters GP."